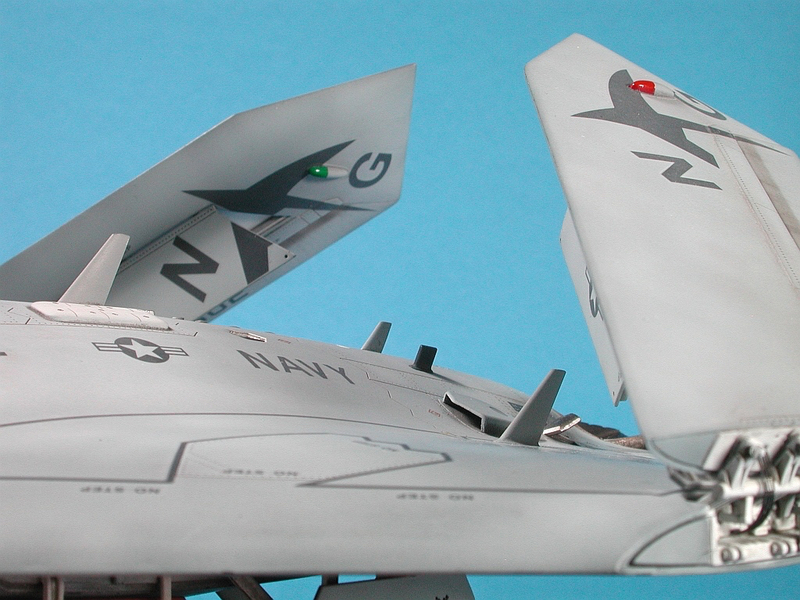 The Modelling News: Northrop Grumman X-47B UCAS - Build Review Pt I. 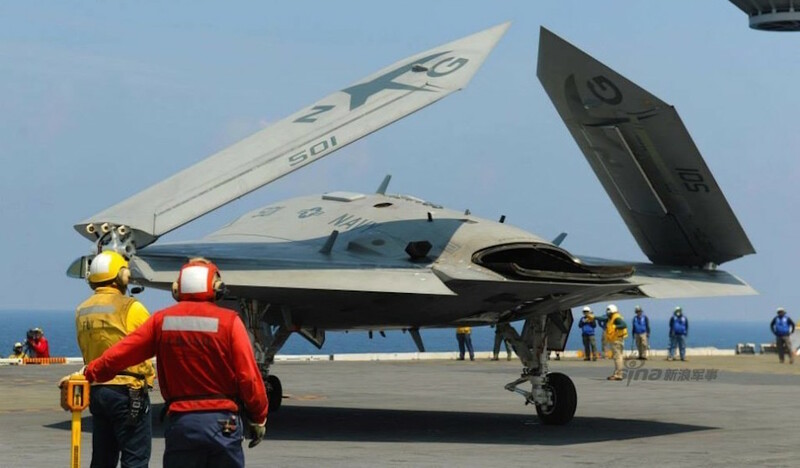 The U.S. Navy’s X-47B Unmanned Combat AirSystem (UCAS) program was designed to demonstrate the ability of a tailless, fighter-sized unmanned aircraft to land on and be launched from the flight deck of a Navy aircraft carrier while underway at sea, one of the most challenging aviation environments. Under a contract awarded in August 2007 by the U.S. 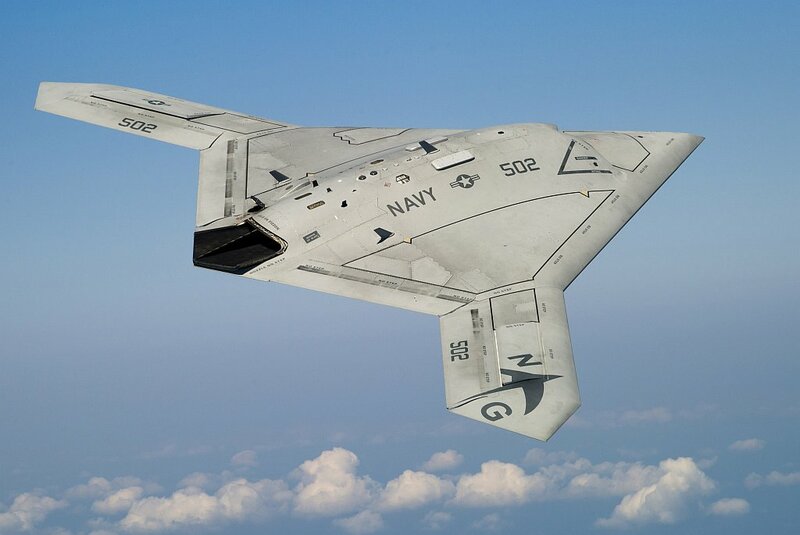 Naval Air Systems Command (NAVAIR), Northrop Grumman designed, produced and is flight testing two autonomous, low-observable relevant demonstrator aircraft designated the X-47B UCAS. Completion of these historical events meant that all carrier demonstration objectives had been met. 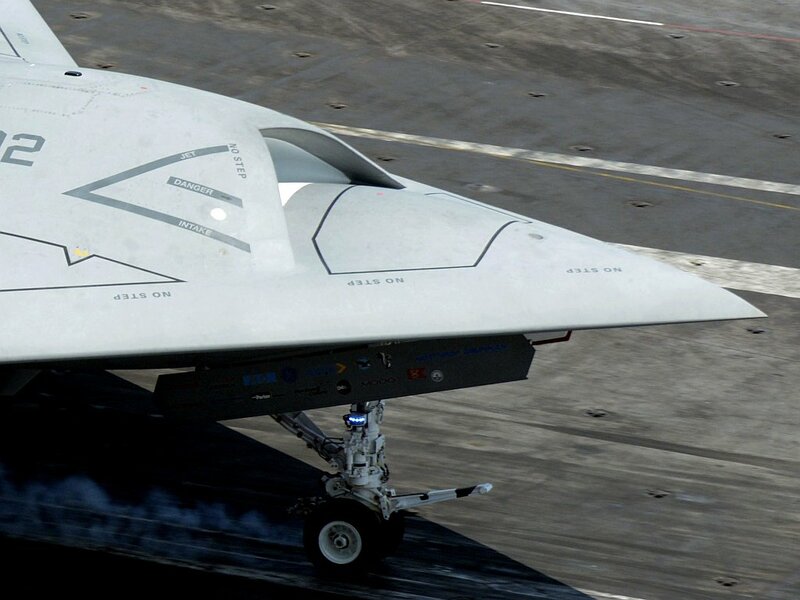 However, the Navy decided to keep the X-47Bs fling to learn more about, and reduce risk for, unmanned carrier aviation. 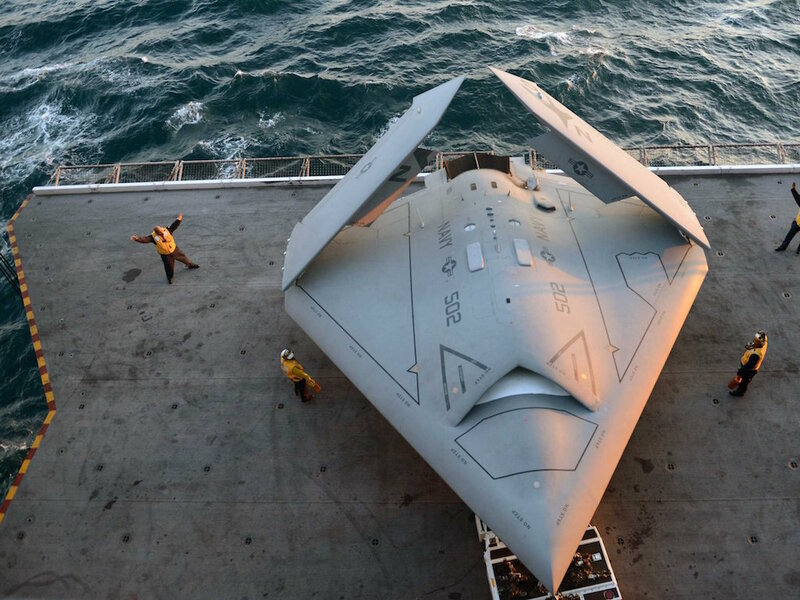 To date, the X-47B has conducted operations aboard three different aircraft carriers: USS Harry S. Truman (CVN 75), USS George H.W. Bush (CVN 77), and USS Theodore Roosevelt (CVN 71). 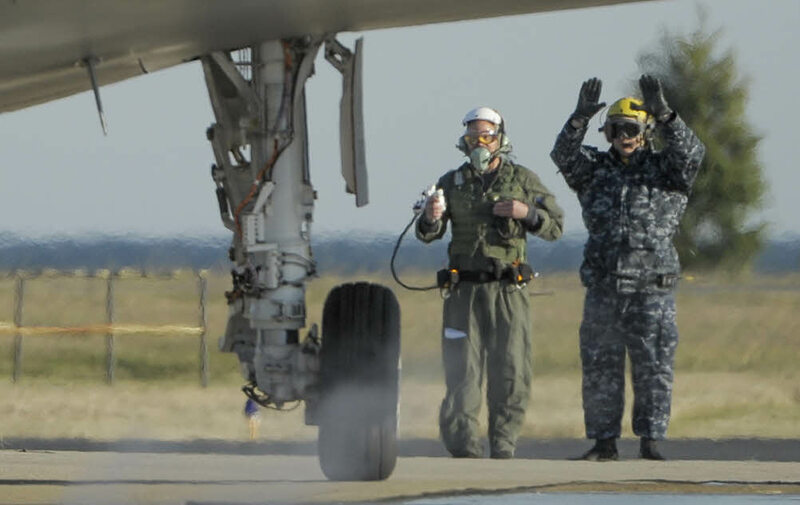 In addition, the capability to conduct autonomous aerial refuelling has been developed utilizing a surrogate aircraft, in anticipation of demonstrating the refuelling of an X-47B in flight. 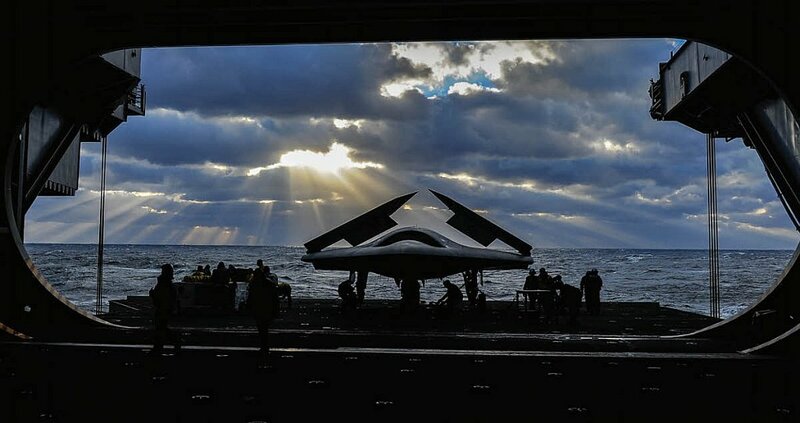 The successful X-47B flight test program is setting the stage for the development of a more permanent, carrier based fleet of unmanned aircraft. 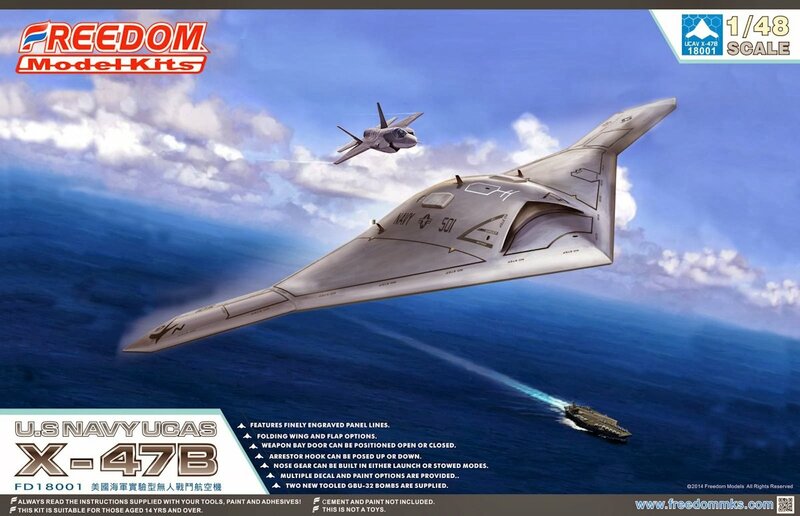 Freedom Models is a relatively new entrant in the plastic scale modelling market and for their debut kit they chose to model a subject that I found both interesting and topical, the Northrop Grumman X-47B UCAS in 1/48. 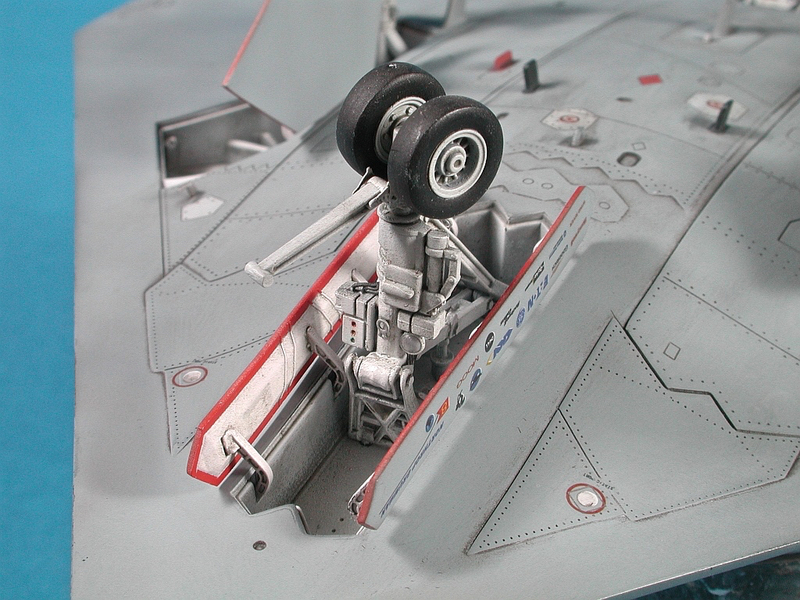 As a kit, the X-47B has been done before in 1/72 by Platz but never before in 1/48. 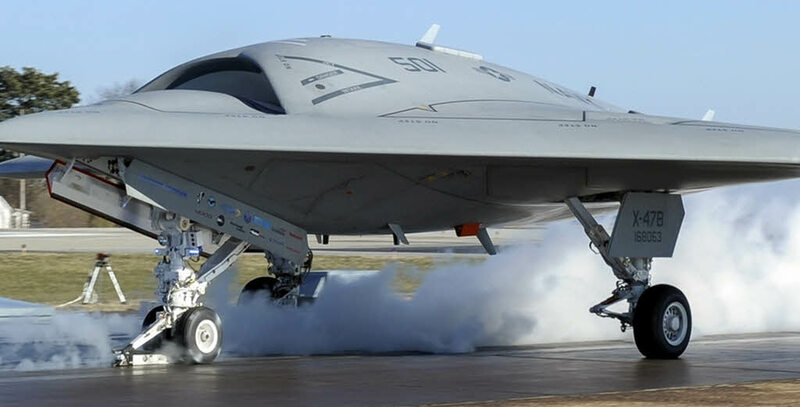 Being an unmanned drone the X-47B seems (like most unmanned aircraft) to polarise the modelling community into those that love it and those that hate it. I definitely fall into the first camp. I find the concept of both remote piloted and now autonomous combat/recon aircraft to be a fascinating subject for modellers. 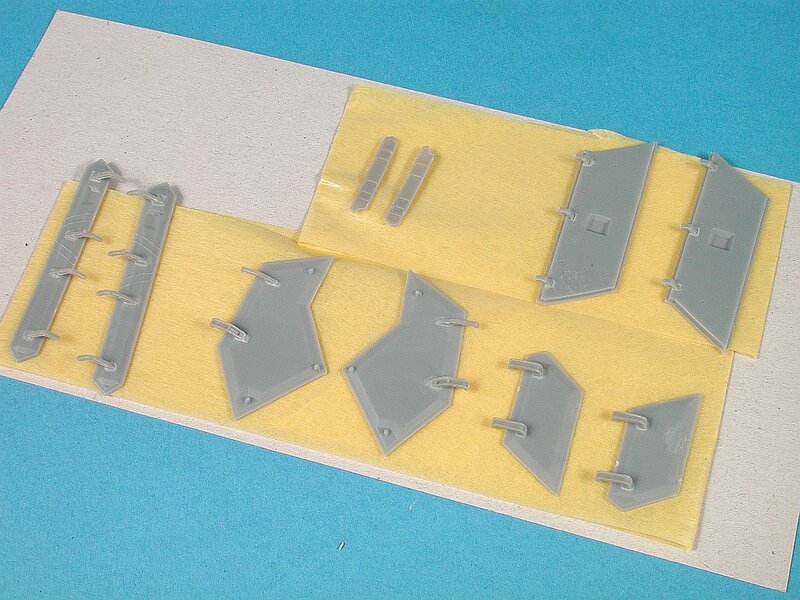 Upon first opening the box I noted that the main fuselage parts had that subtle "orange peel" roughness to the surface. 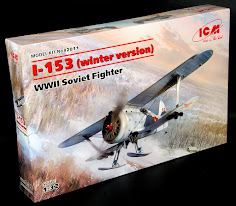 This I have found is quite common with kits manufactured in China and is similar to what you would find in recent Kittyhawk or Kinetic boxings. 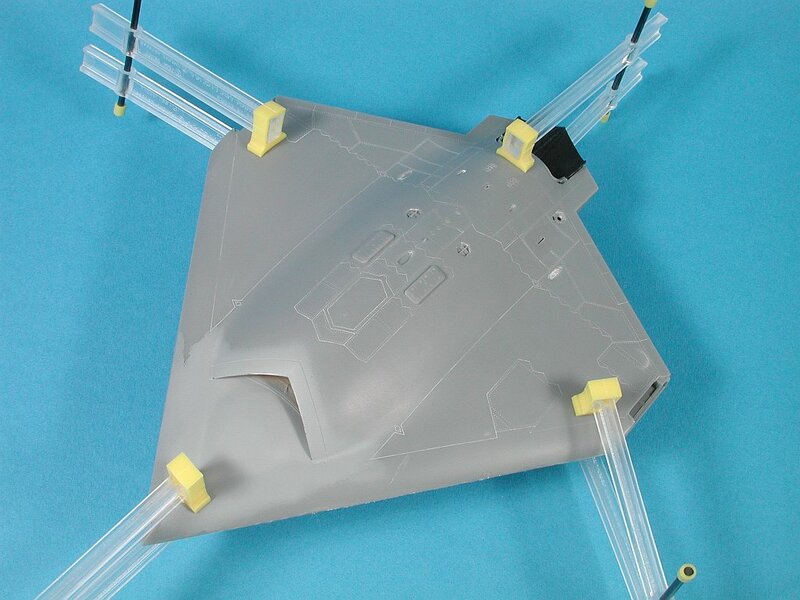 The roughness is easily dealt with by some light sanding which is no drama on the X-47B as it’s a very streamlined shape. Of course being a drone there is no cockpit to contend with, which means the build proceeds a lot quicker than your more traditional aircraft build. 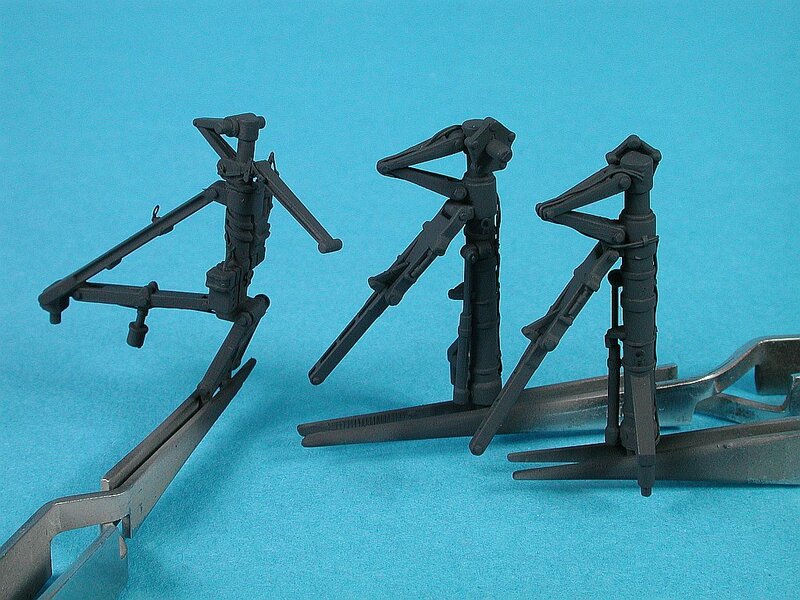 I found the general fit of the parts to be excellent requiring little or no filler. A small photo etch fret is provided and unlike other manufacturers, Freedom have sensibly provided parts in PE that make benefit from the scale thinness afforded by brass which you just can't reproduce in plastic, the wiring loom in the wingfold is a good example. A feature of the kit that I thought was above average was the instructions. 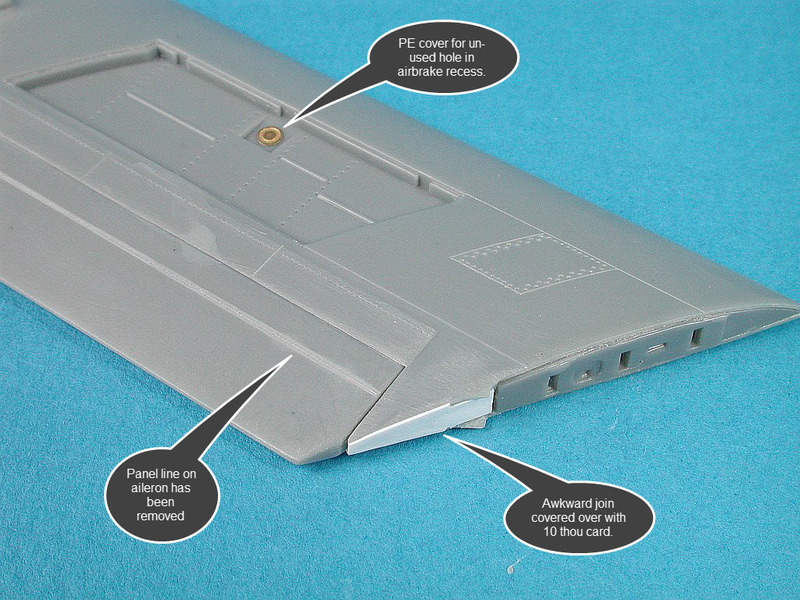 I really like the way Freedom have provided clear diagrams of how parts should be aligned to each other which is of great help when assembling the model. Freedom have clearly done their homework and it shows in the details. The inclusion of options to fold or unfold the wings, open of close the bomb bays and several "what if" decal options for possible future carrier deployments are testament to the effort that went into this kit by the Freedom team. If I had to pick one thing I would like to see Freedom improve it would be the decals. Not in terms of accuracy (although I did smile when I saw one of the stencils said "BEWERE OF BLAST") but in terms of the thickness of the decal material itself. 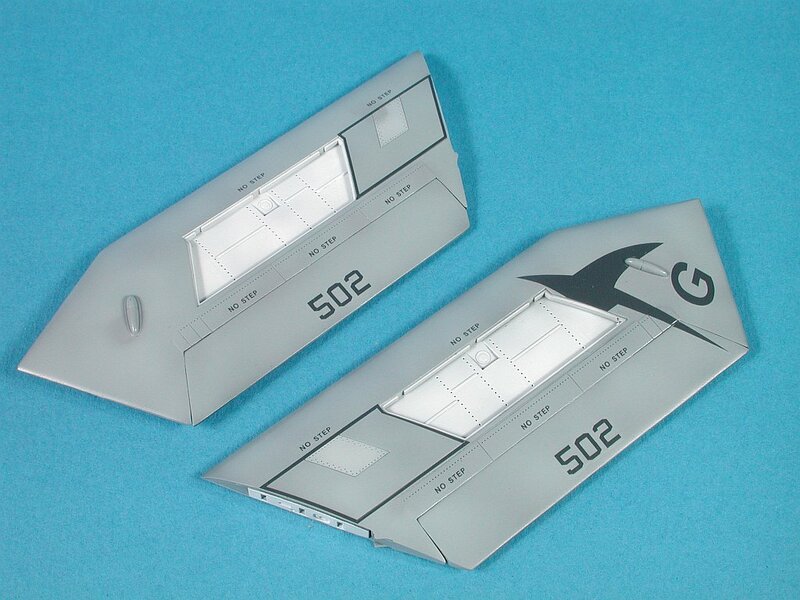 Compared to high quality decals from the likes of Cartograf (which these days you get even in a $10 Airfix kit) the box decals for the X-47B are very thick. The decals did perform well and responded to setting solution but I found myself cutting away as much of the thick clear carrier film as possible. Overall I'd rate this kit an 8/10. 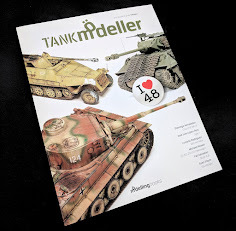 It's an interesting subject, it's been well researched, it's been properly engineered with sensible parts breakdown and the assembly/painting instructions are clear. The following photos and comments relate to my build of the Freedom Models X-47B which I chose to model as the 2014 demonstrator used in carrier trials. 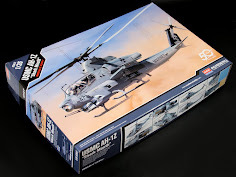 As the build is relatively simple I have taken a slightly different path for this build report. Typically I document my builds in chronological order (i.e. 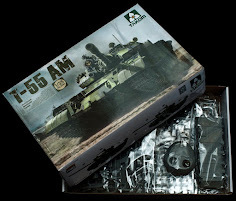 the order in which I do things, which is almost never strictly as the instructions specify) but this time I have used the kit assembly sequence as the ordering for the build report. As a diehard aircraft modeller it feels odd starting a new model and not doing the cockpit first. Step one however this time around was the nose undercarriage. 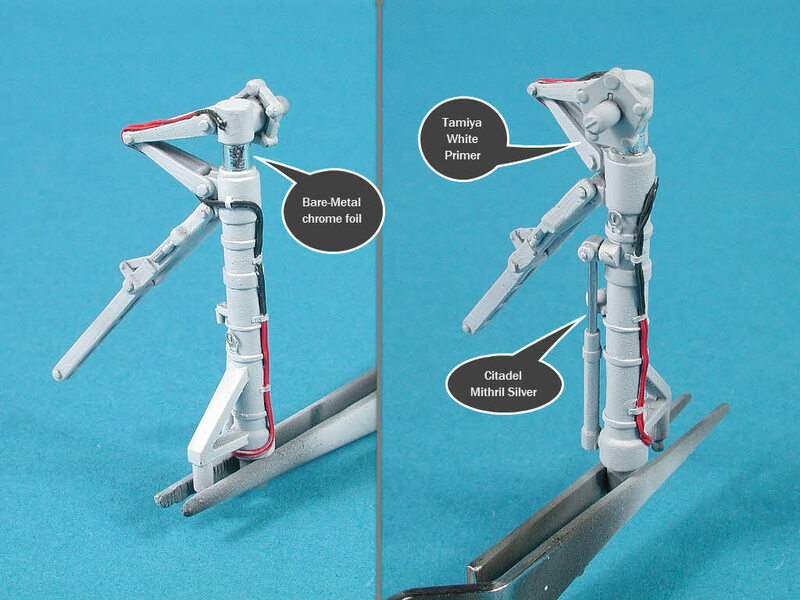 Options are provided for you to display the catapult arm in the raised or lowered position. 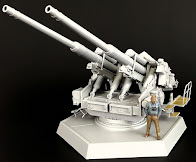 This is a by Freedom and lends itself to those that want to display the model ready for a launch. I had other plans so went with part E5 rather than E6. 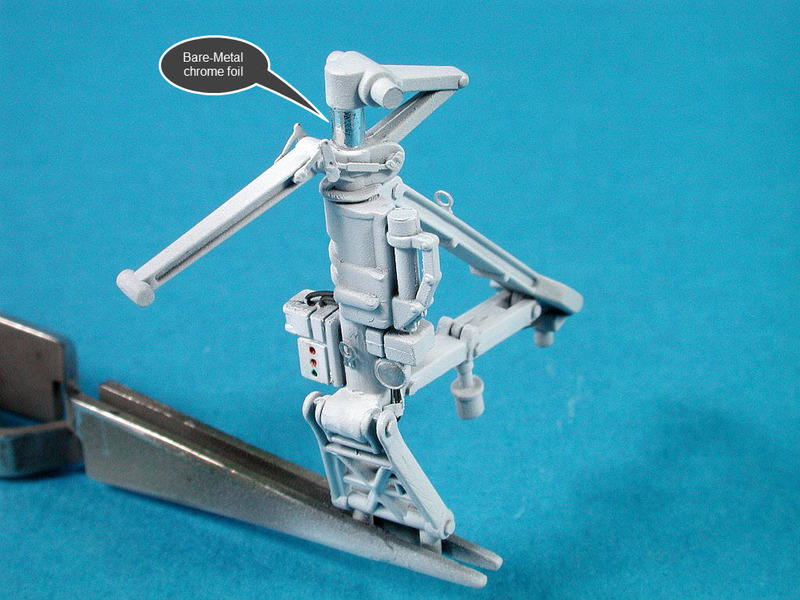 There is room to add some detailing to the kit parts, mainly in the form of cabling and hydraulic lines. 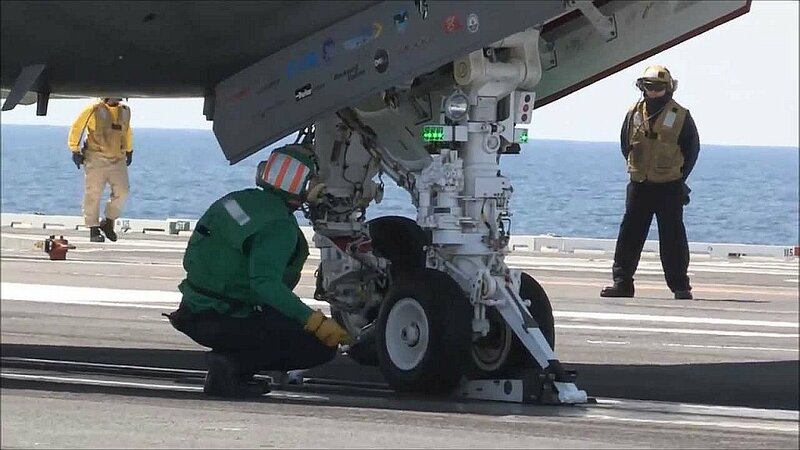 As this picture shows, the nose wheel strut is quite complicated (more so than normal aircraft I think) and perhaps this is because of the extra gear required to remotely steer the machine. 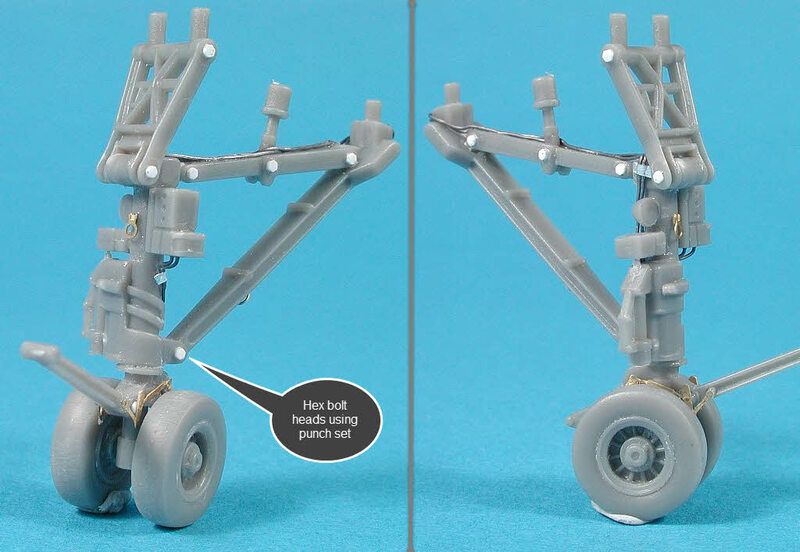 I added some small amount of details to the nose gear in the form of lead wiring and enhanced some of the bolt heads using my Historex Agents hex punch set. 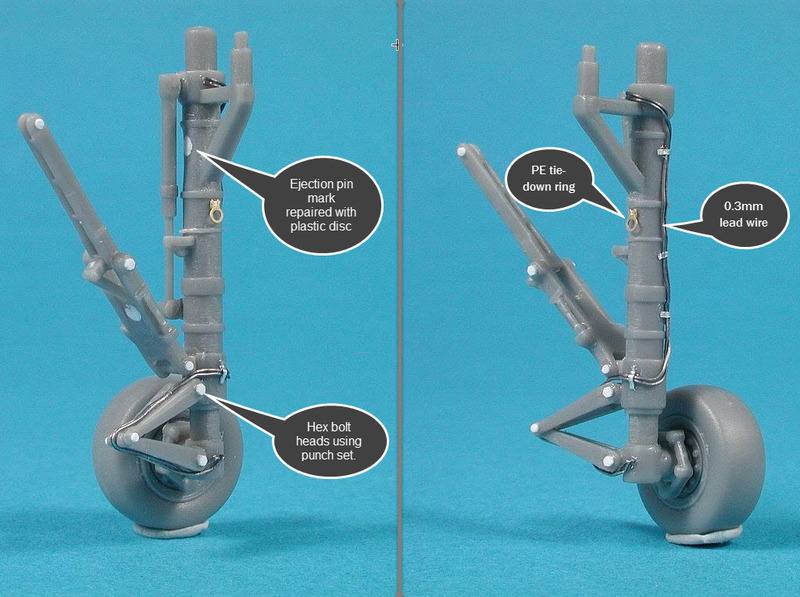 The PE tie down rings and the launch bar actuator rods shown here are provided in the kit from Freedom. A quick test fit of the completed nose gear assembly confirmed that it could be left till the end to be fitted to the main airframe. The undercarriage bays are pretty sparse but two things stopped me from adding extra detail here: a) I had no useful reference photos and b) I have decided that pouring hours into detailing parts that will almost never be seen on the finished model is not productive. 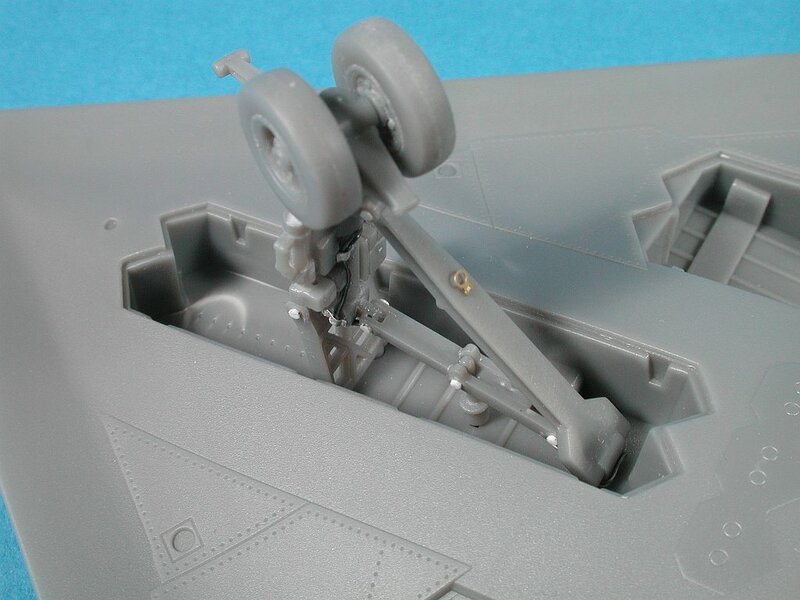 A final oil wash of Davys Grey over the white sections (landing gear, wheel well and wheel hub) completes this step. Step 2 has two stages. Stage 2.1 deals with the right hand main landing gear whilst 2.2 deals with the left. Optional Photo Etch tie down rings can be used here. 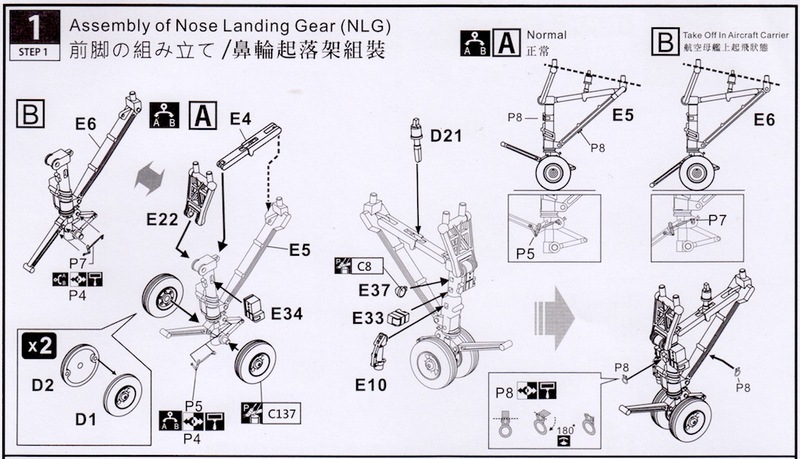 The correct alignment of part E21 for the right MLG (and E20 on the left MLG) is best handled by dry fitting the main strut to the undercarriage bay and then gluing part E21/E20 to the strut to ensure the correct angle is achieved. A good overall view of the undercarriage shows us the colours, cabling details and general sit of the aircraft on the undercarriage. 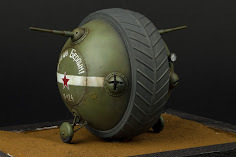 Never trust a model manufacturer too much, always use your own reference to double check even the most basic of things. Happily Freedom Models has done a good job here. 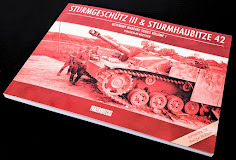 Reference photos show us the location of hydraulic lines as well as the use of colour variations in the lines themselves. This photo is also useful to show the correct alignment of the bay doors when we get to that point. The main landing gear strut and main support had some visible ejection pin marks that I dealt with using plastic card discs (glued then sanded flush). Like the nose gear I have added some hydraulic lines from 0.3mm lead wire and assorted hex bolt heads using my Historex Agents punch set. The kit tires have no tread (the real tires have a standard tread pattern). 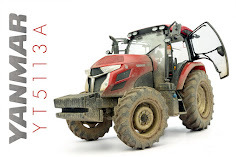 MustHaveModels have recently released a set of resin replacement wheels which do provide a tread pattern. Here we see the parts being test fitted in the wheel well. 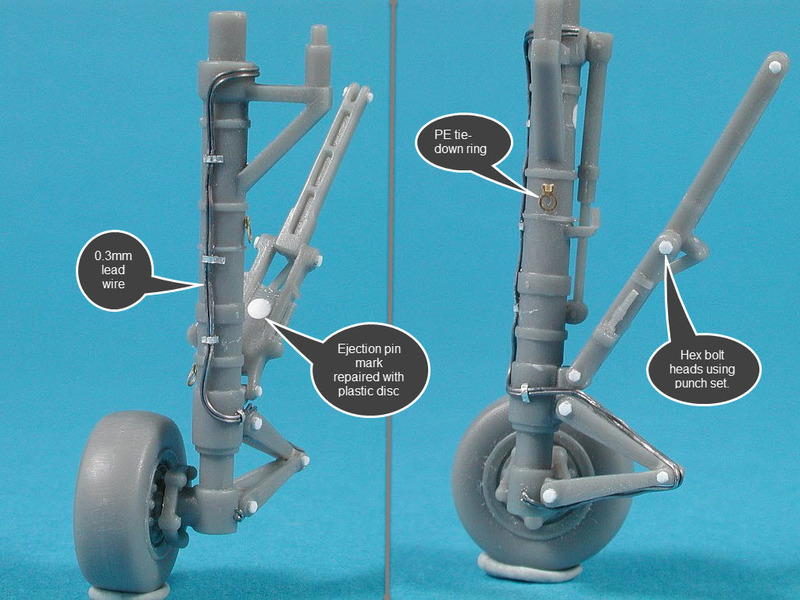 The parts were left in place while the glue dried to ensure the correct angle was achieved on the support strut (part E21). With both MLGs complete a final test fit into the wheel wells to make sure the general alignment is accurate and that both sides are even, after all we don't want the finished model to sit lop-sided and now is the best time to check so we can correct it if any problems are found. During my recent builds I have taken to base coating cockpits, wheel wells and assorted accessories (like landing gear) in black. It may seem a little counter intuitive to prime a part that is to be white with black but it actually works well because it helps to give the white some depth rather than being too stark (which can happen to white if not toned down in some fashion). 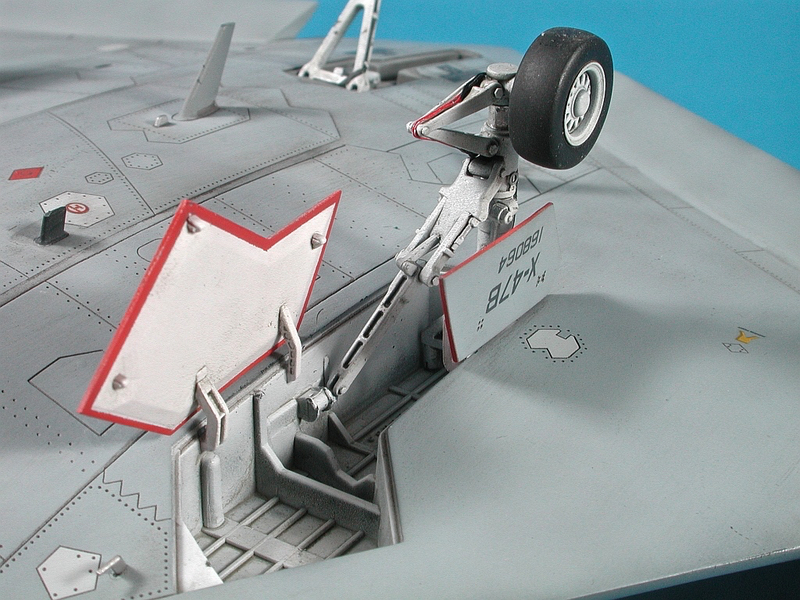 For the X-47 landing gear I have used Tamiya NATO Black XF69. 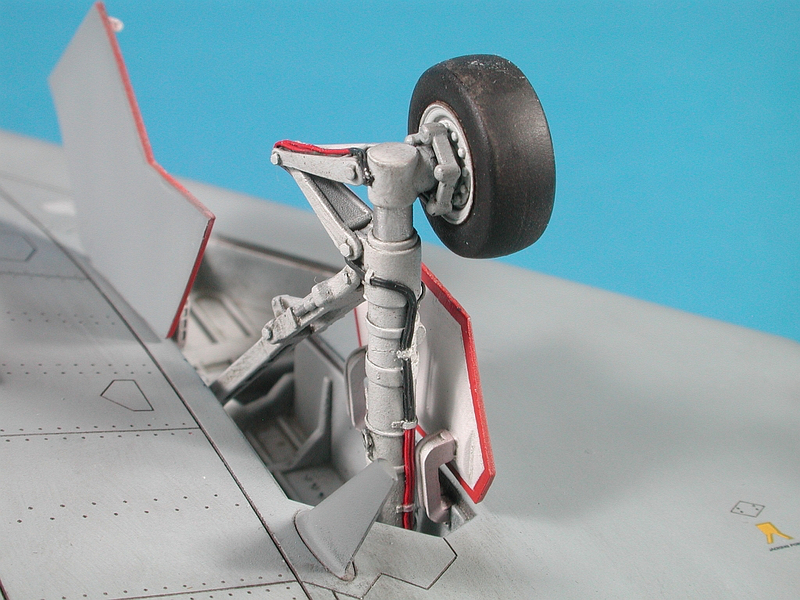 A couple of coats of white have been applied to the landing gear. 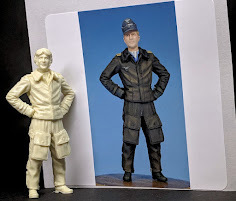 I have been experimenting with different whites to see which one provides the best coverage and for now have settled on Tamiya White Primer which is only available in a rattle can. I don't like rattle cans and so prefer to decant the cans contents into a normal bottle for use in my airbrush. 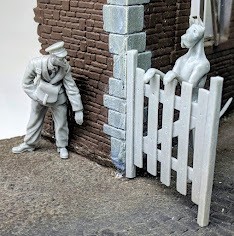 The Tamiya White Primer is very hardy and covers very well in only one or two applications which means you don't need to build up several coats to avoid the transparent effect. Once the white is dry it’s time for some final detail painting on the landing gear. Vallejo paints are my favourite for brush painting as seen here on the hydraulic lines. 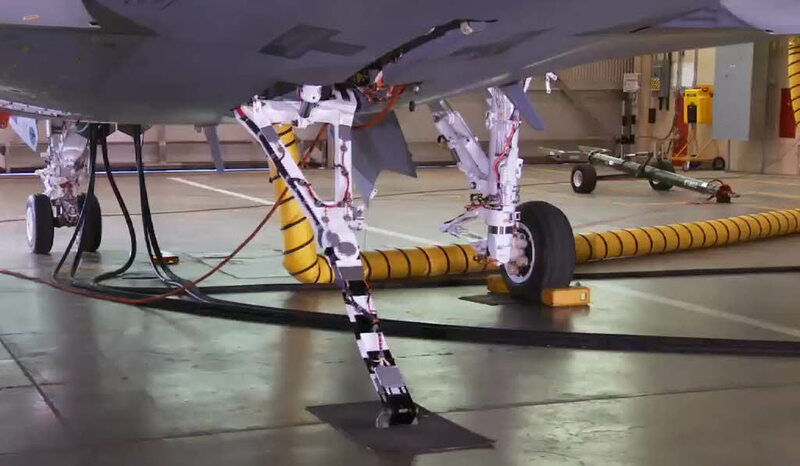 Most every modern aircraft has some form of shock absorbing strut built into the landing gear. The piston in the strut is often visible and typically a very shiny chrome finish. 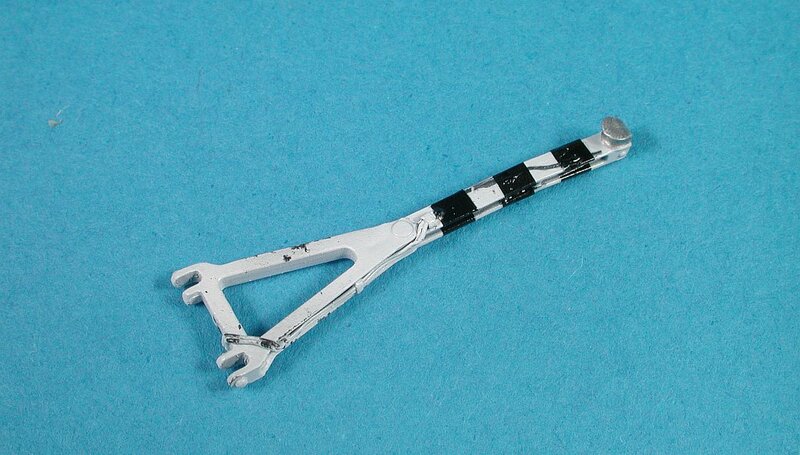 The best way to simulate this I have found is to use a small strip of self-adhesive Bare-Metal Foil (Chrome) wrapped around the strut. It's easy to use and looks very convincing. For metal parts that need to be hand painted I like to use the metallic colours in the Citadel paints range. 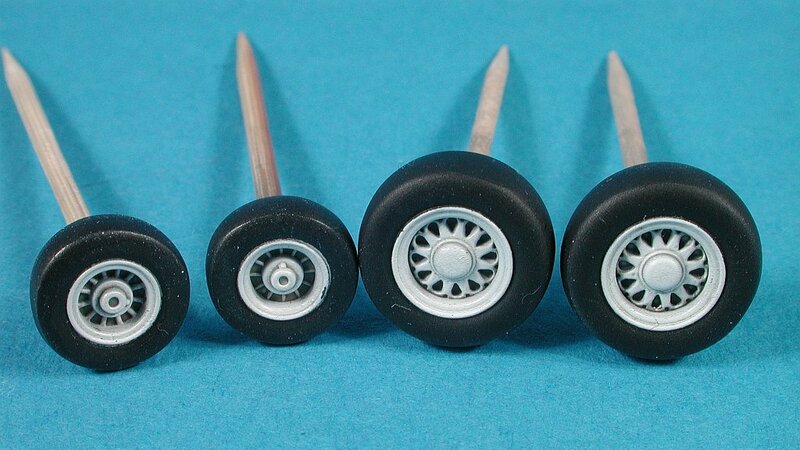 The wheels and tires have been painted (Tamiya Rubber Black XF85 + Tamiya White Primer). I normally paint the black first then mask off the hub with Tamiya tape cut using a circular scribing template and then apply the white. The detail in the wheel hubs has been accentuated with a light wash of Davy's Grey oil paint. A view of the finished port MLG fixed to the main airframe during final assembly. 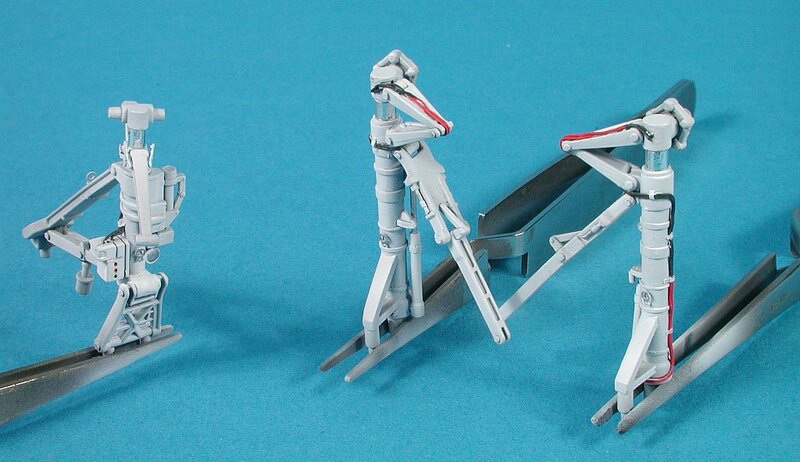 Here we see all three landing gear assemblies fixed into place on the final model. 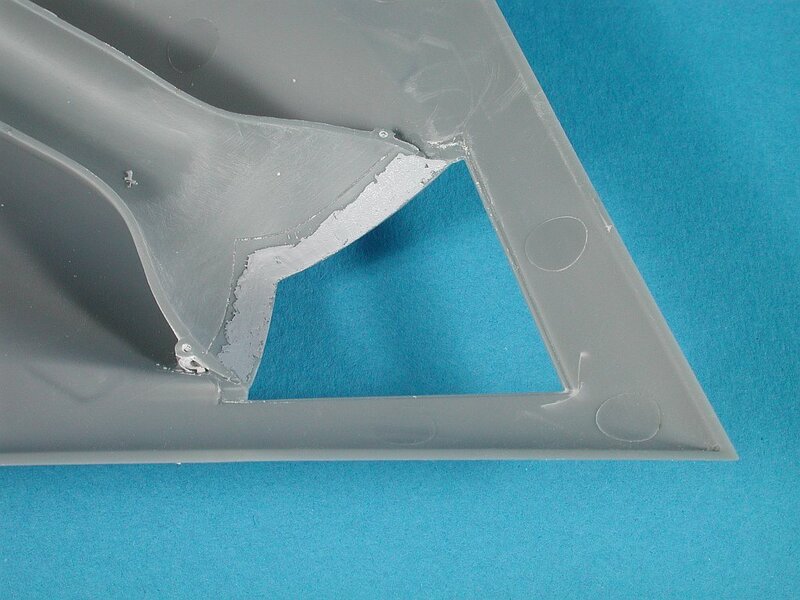 To ensure a very strong bond I like to use two part epoxy glue for any load bearing parts like undercarriage. 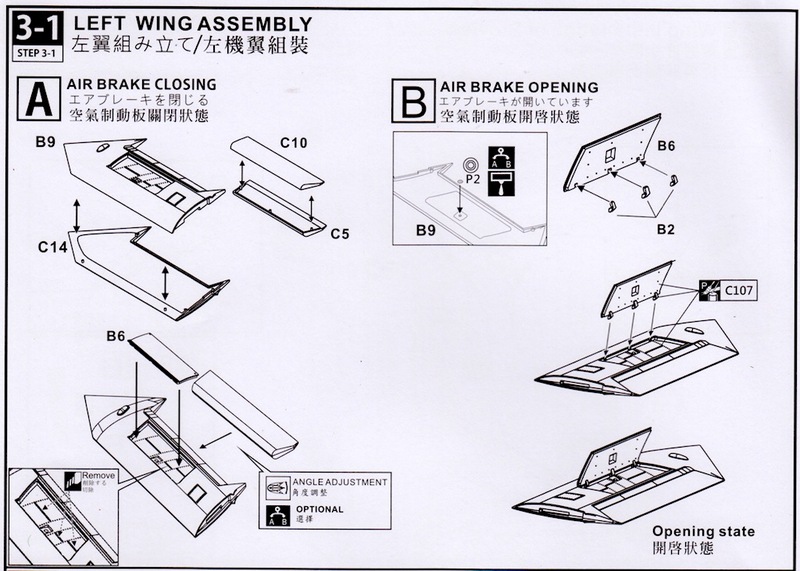 Steps 3.1 and 3.2 cover off the assembly of the left and right wings. Due to the unique shape of the X-47's fuselage the wings themselves are quite stubby. 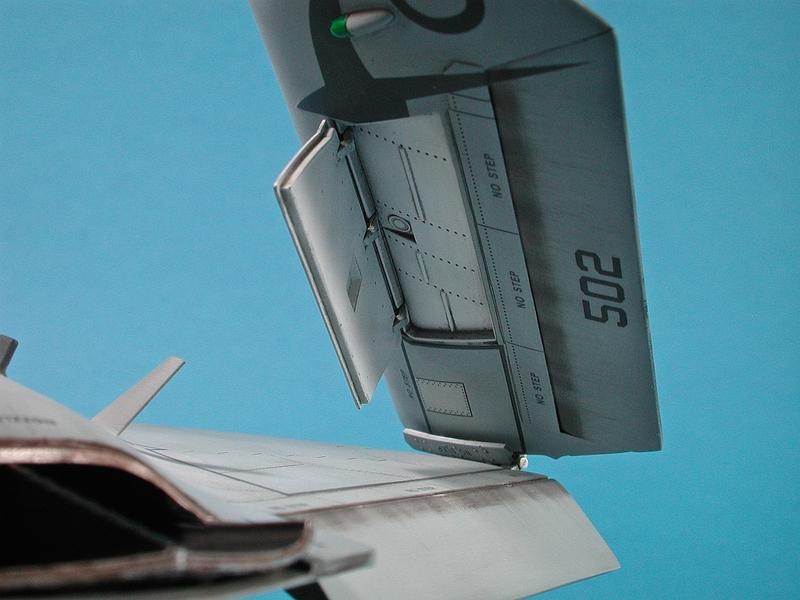 Air brakes (or spoilers) are fitted to the top of each wing and when the wings are folded the airbrakes droop open with gravity making for an interesting feature on the model. 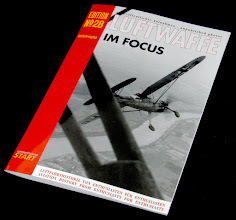 A useful study of the wings in the folded position. Note that because power is applied the hydraulic systems are pressurised and the air brakes are closed. When powered down the air brakes open with gravity and hang down below the folded wings. 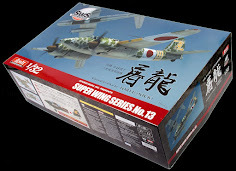 Both wings are easily assembled with a minimum of fuss. The fit is good and only the seams on the edges need sanding when dry. The ailerons seem to always be in the neutral position and the inner end of the wing contains the support bracket for the wing-fold. 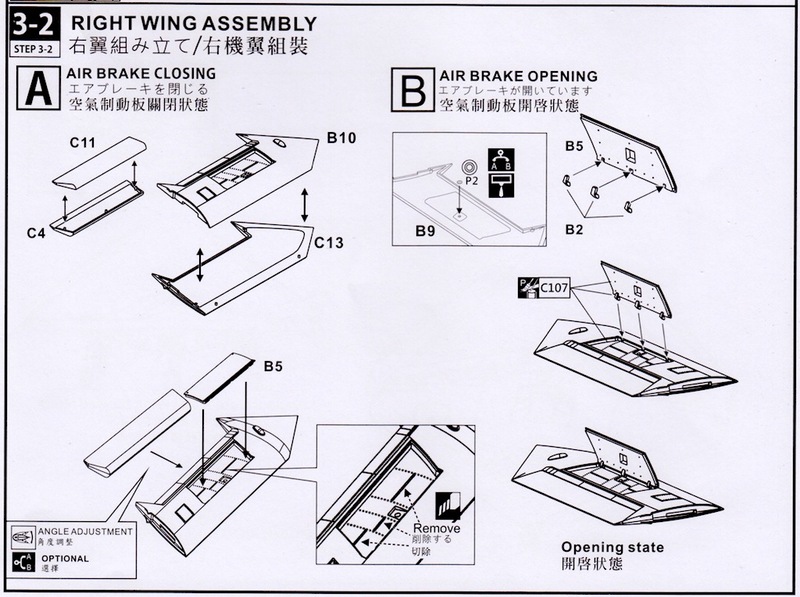 If you plan to display the wings unfolded be sure to consult the instructions as the parts needed are different than shown here. A close in view of the port wing upper surface. Note the small circular PE disc in the centre of the air brake recess. I am not sure why Freedom provided this as PE because it is used to cover a hole in the recess which I assume was originally moulded inaccurately (perhaps for an actuator??) and rather than remove it they simply provided a cover in PE. Also note that I have filled the panel line on the aileron. I repeated this on both top and bottom of both ailerons and flaps. 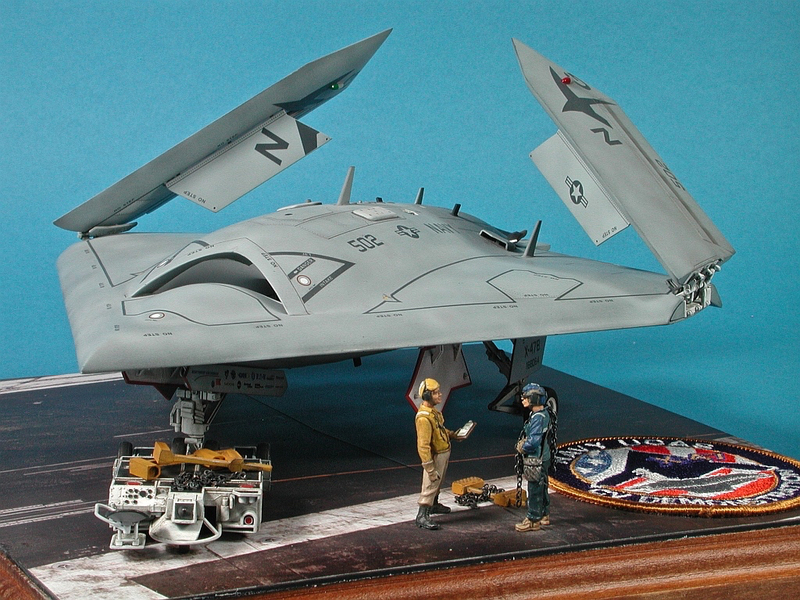 Based on photos of the real X-47 I could not see evidence of any panel lines here. 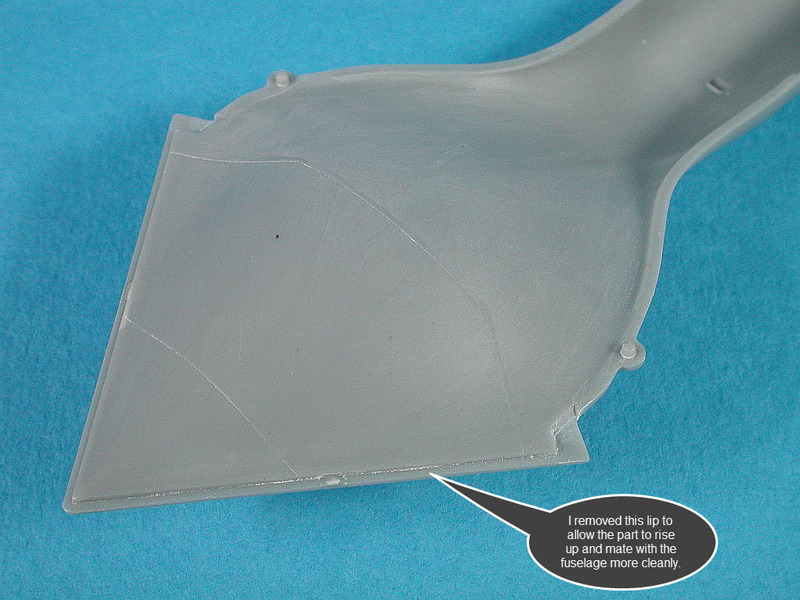 The air brake recess and wing-fold have been masked and sprayed with Tamiya Primer White. Painting and decaling on the wings is now complete. It’s a pity that with the wings folded most of the nice detail provided here will be hard to see on the finished model. 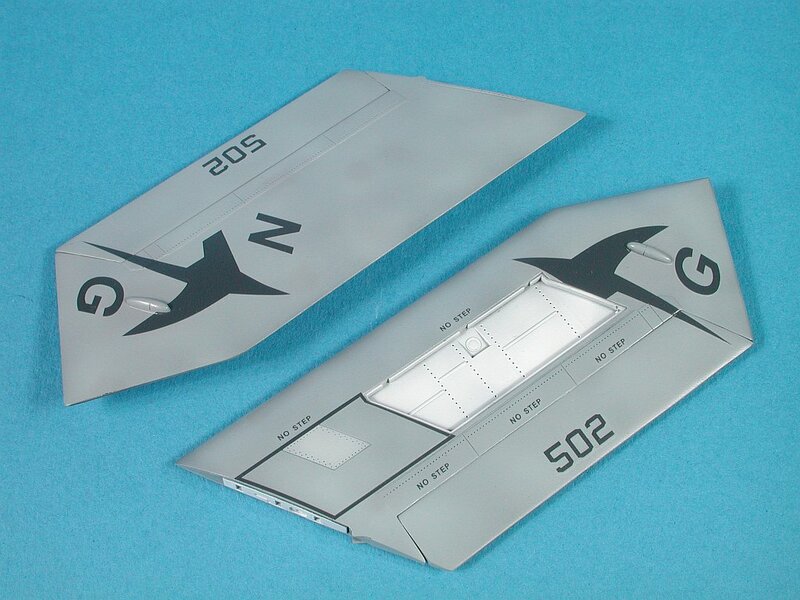 Its a good addition by Freedom that the decals which touch the navigation lights have a small cut out which helps to position the decal correctly and means you do not have to fuss around with getting the decal to sit over the raised detail. The only final touches needed on these parts are to paint the navigation lights (Mr Color Clear Red and Green) and apply some weathering (with pastel chalk) to the leading edge of the ailerons to simulate wear and tear of the moving parts. Here we see the folded wings on the finished model. 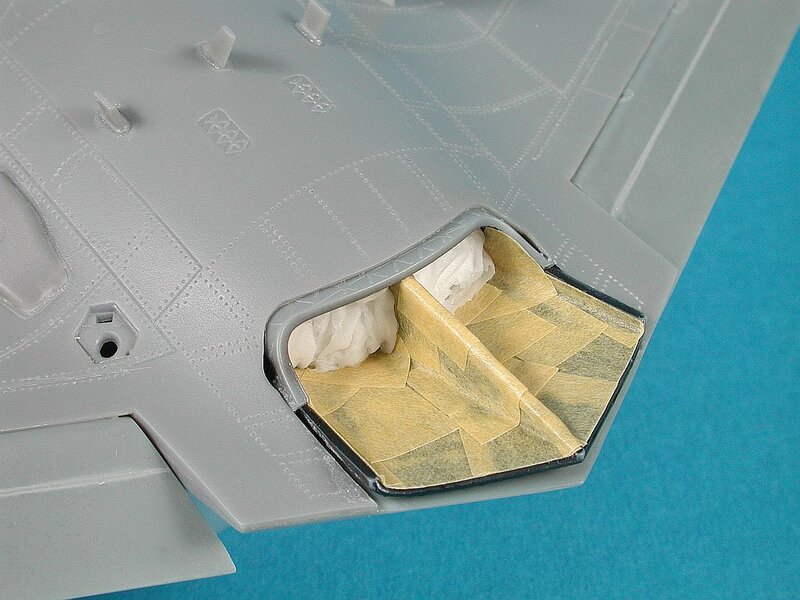 Note the open air brake and the pastel chalk weathering applied to the front of the aileron. 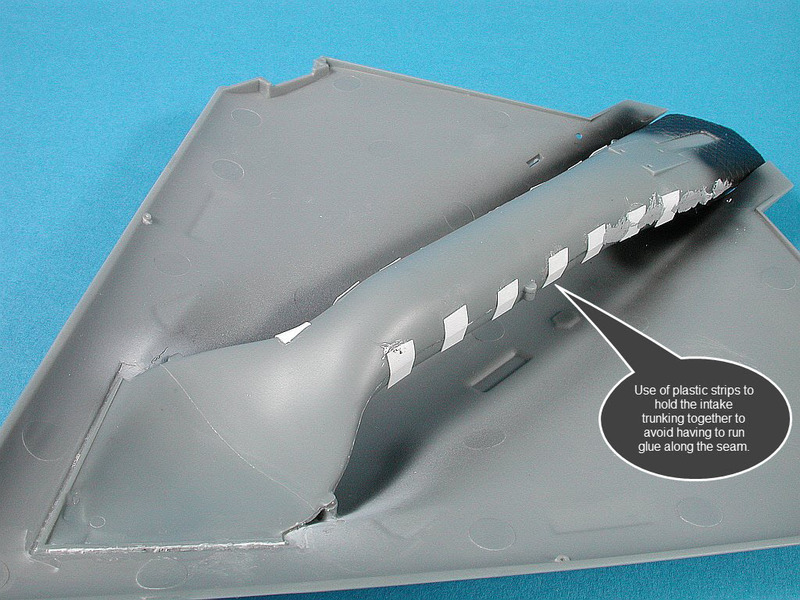 This weathering is to simulate scuff marks left by the movement of the aileron in flight. A good shot of the wings showing the folded angles as well as the red and green nav lights on the tips. Step 4 involves the assembly of the intake and exhaust trunking. 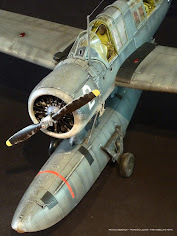 This configuration is about as simple as it gets for jet aircraft models with a top and bottom and two internal "plugs" for the front and rear of the engine. 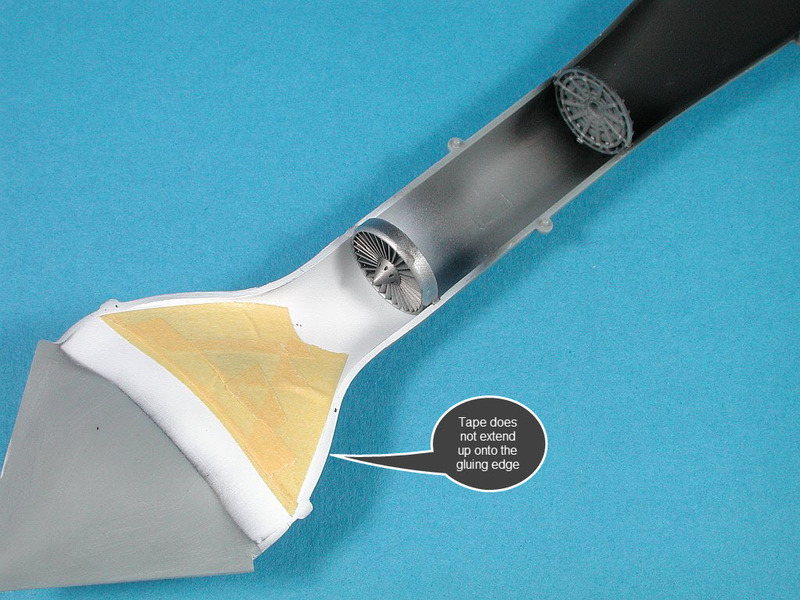 From experience I know that it will be virtually impossible to mask this type of intake once the parts are assembled. Instead I have pre-painted the bottom portion of the intake trunking and pre-masked it. I now need to make sure that when I glue the top and bottom (C1 to B1) together that I do not get any glue seeping inside (to ruin the paint). The front face of the engine has been painted Alclad Aluminium and the rear section of the exhaust painted basic black. Rather than follow the assembly sequence in the instructions to the letter it was now that I deviated based on experience. I knew that if I glued the intake parts together at this point and then tried to mate them to the fuselage it would be challenging to get a clean join. 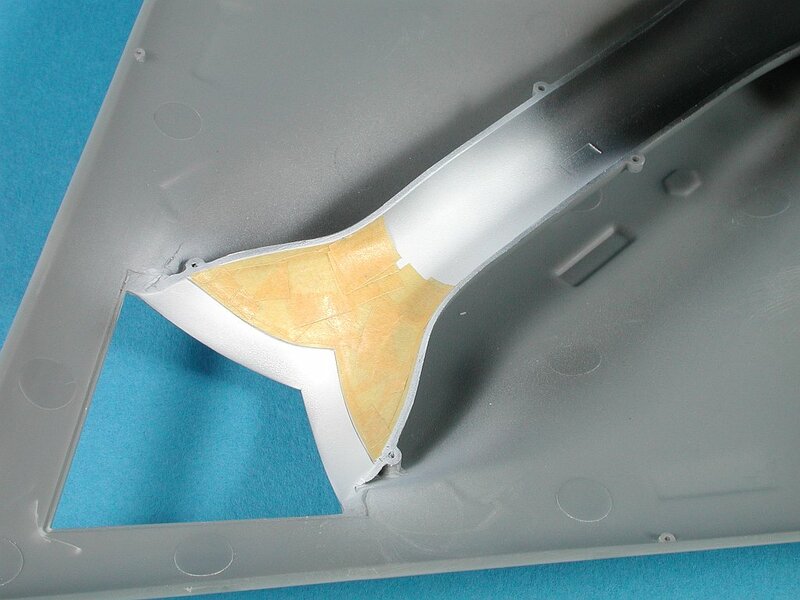 So instead I first glued the top of the intake (part C1) to the upper fuselage (part A1). This allowed me easy access to clean up, paint and mask this area prior to mating the bottom of the intake trunking and then closing up the fuselage. 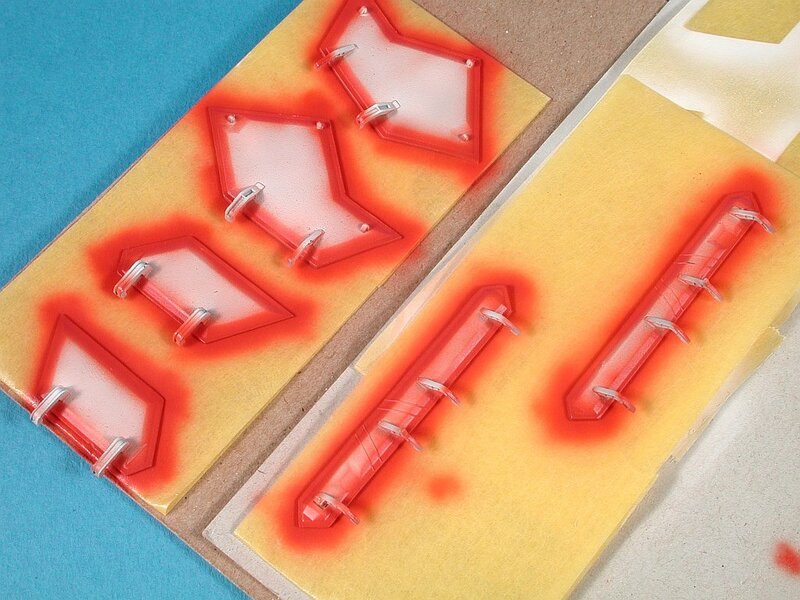 Step 1 is to glue and fill the seam between the parts C1 and A1. 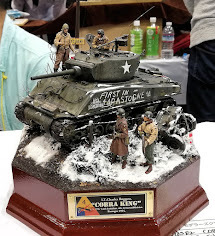 Tamiya Basic Putty does the job. 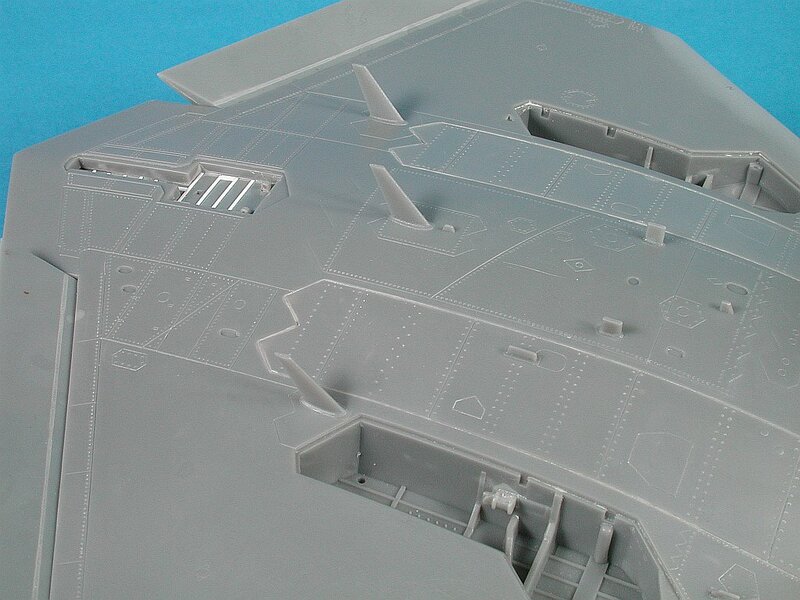 Step 2 is to sand the seam and check with a coat of grey primer (Alclad Grey primer in my case). 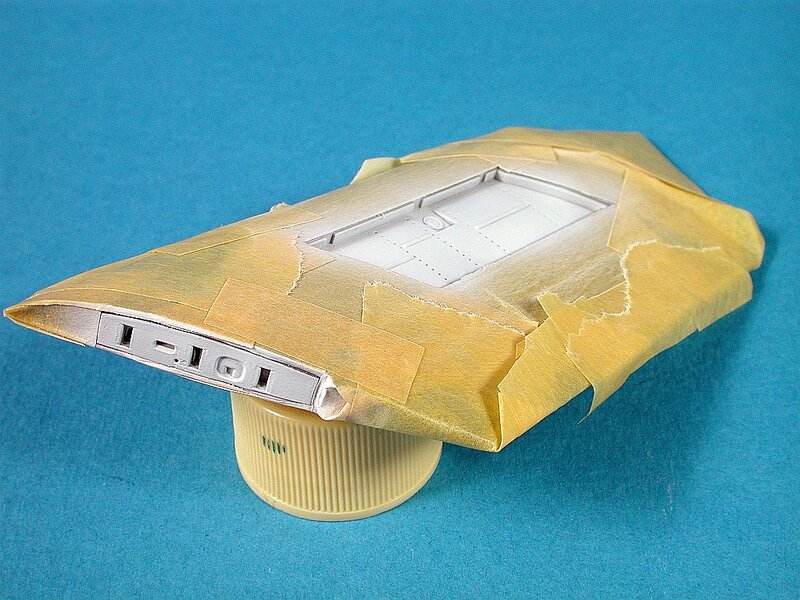 Step 3 is to paint the interior white and then mask off using Tamiya tape. 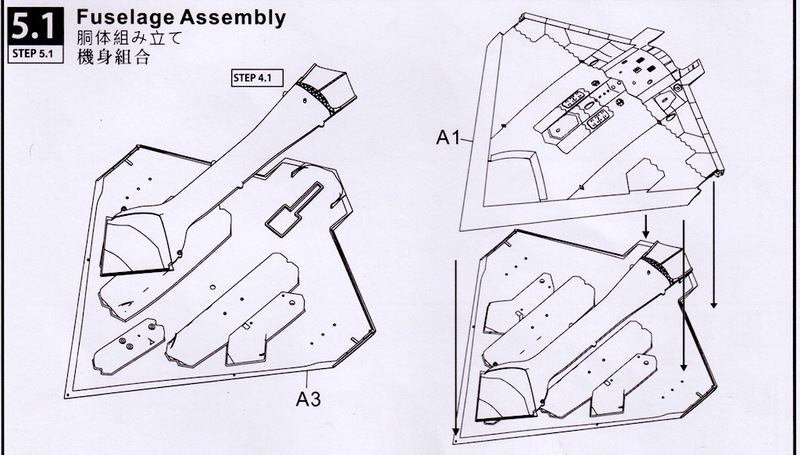 This assembly is now ready for mating with parts B1 and then to A3. Step 5.1 involves mating the intake/exhaust assembly with the fuselage and closing it all up. 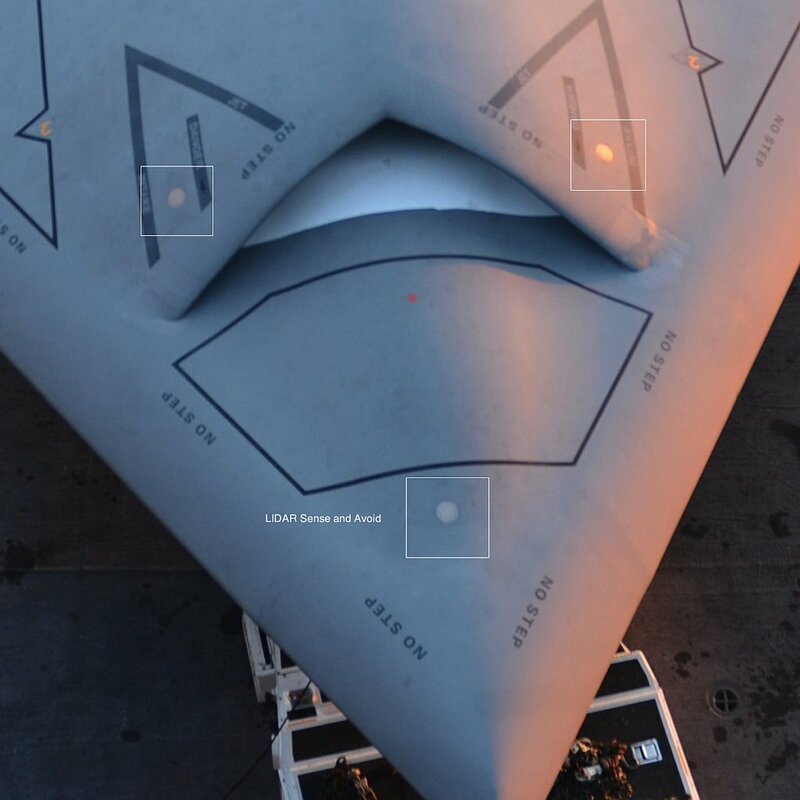 The shape and contours of the nose of the X-47B is quite distinctive. To minimise radar reflections it is desirable to eliminate all panel lines or sharp edges on the nose. The kit seems to accurately reproduce the complex compound curves of the area in and around the intake inlet. 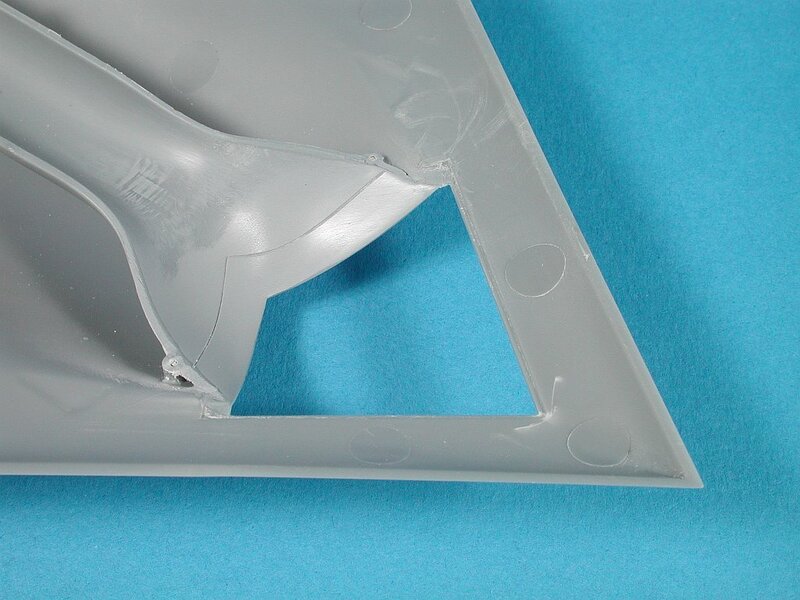 The fit of part B1 to the triangular hole in the top fuselage is pretty good but the lip on the intake part does not allow it to rise up enough to meet the fuselage and a small step is the result. No panel lines or steps are evident on the real aircraft so I needed to do some adjusting and trimming here to eliminate as much of the step as possible before gluing. The first task in minimising the step is to remove the alignment lip from the intake part. With this removed it is possible to now lift the part up higher to better match up with the forward fuselage. It would be possible to just glue the two together and then use filler to eradicate the step but that somehow seems like even more work. With the lip removed it’s time to join the lower intake (B1) to the upper fuselage. As I had already painted the interior of the intake and exhaust trunking I did not want to risk the chance of any glue seeping inside of the join and potentially ruin the paint. So rather than running glue along the join like I normally would do I used a series of plasticard braces along the length of the two parts to glue them together. These braces had the glue on them and therefore I did not need to apply glue to the seam itself. It seemed to work ok so score one for lateral thinking I guess. With the nose parts now glued together I needed to sand the curved nose section in front of the intake to match the contours of the real aircraft. This photo provides a good side view of what this needs to look like. After much sanding and a little filling with super glue and a strip of 10thou card the nose cross section looked about right to me. 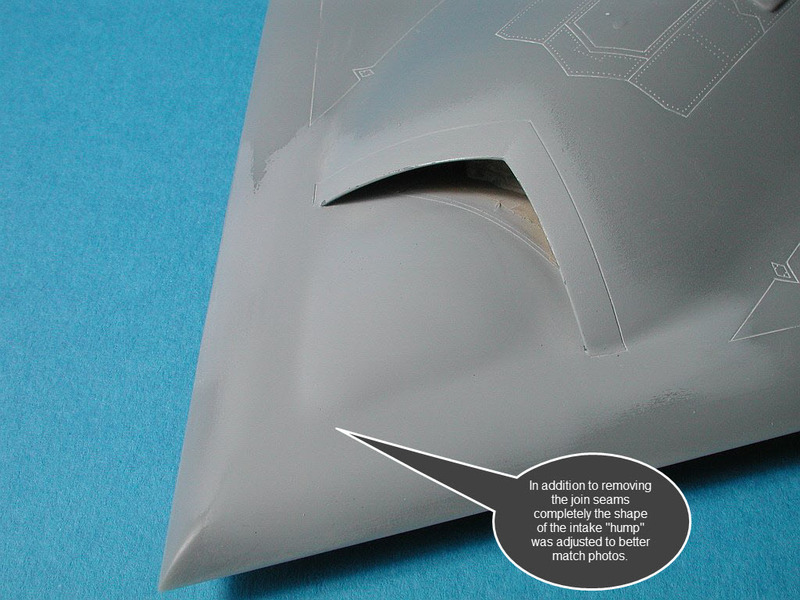 The seams and panel lines were removed completely from the section of the model. Many times its only under a coat or primer that we really find out how our efforts have turned out. I was very happy with how the shaping of the nose curves had ended up. Notice that I have rounded out the curve at the very front of the bulge. 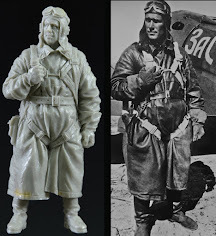 This was much more pointed out of the box which did not match up well with photos of the aircraft. With all the nose work complete to my satisfaction it was time to glue the top and bottom fuselage parts together. She was finally starting to look like an X-47. The fit was very good and the clamps are really only needed as a precaution while the glue sets. The exhaust was masked after assembly mainly because it was far more accessible than the intake would have been. This will be later sprayed with Alcald metalizer and masked off prior to main painting. 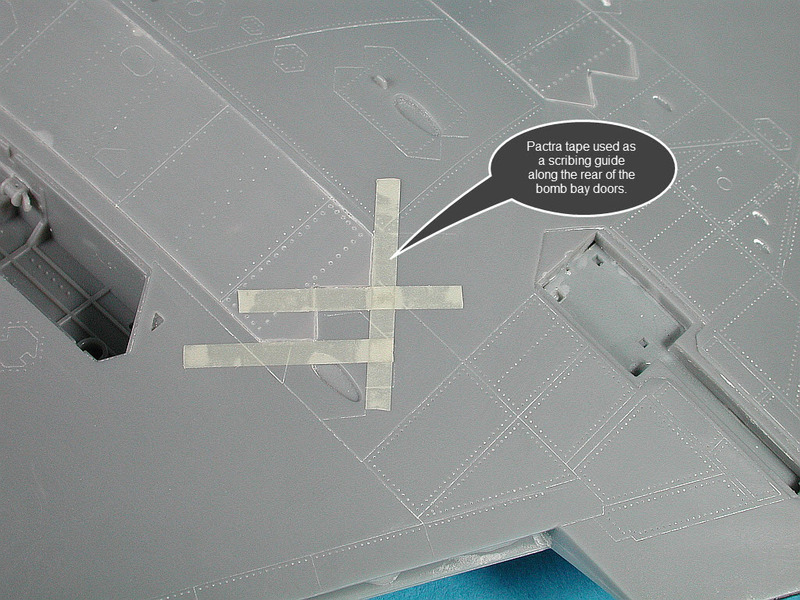 Steps 5.2 and 5.3 cover the assembly of the landing gear bay doors. 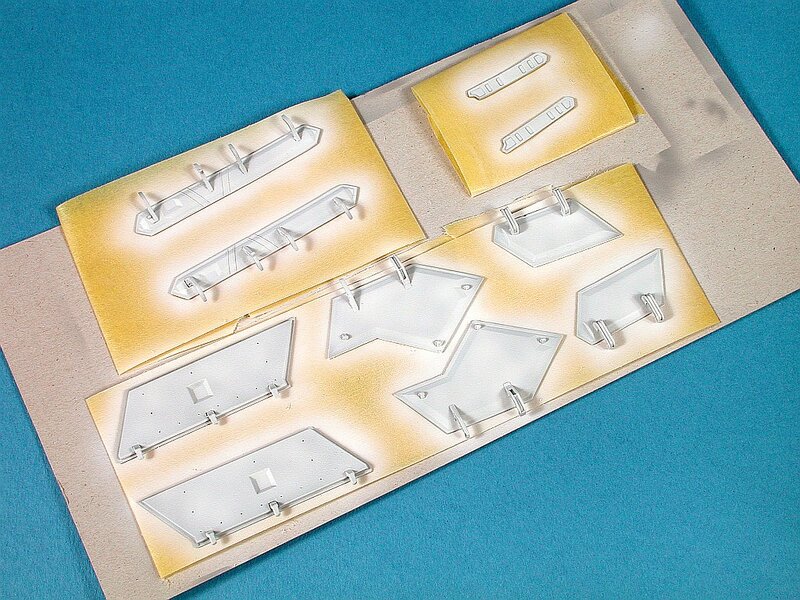 Each hinge bracket is supplied as a separate part which are glued to the relevant door. 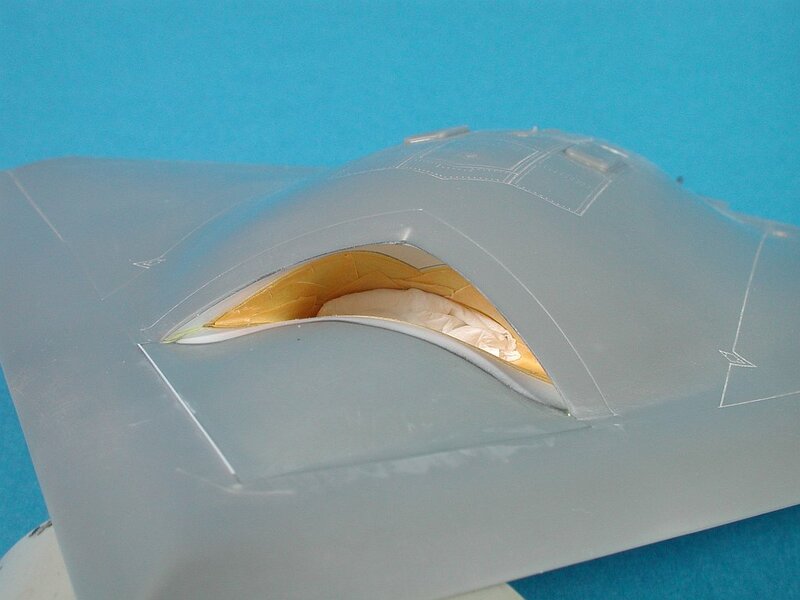 Proceed carefully here as many of the parts look the same but have subtly different angles that can impact the fit and alignment of the door when attached to main airframe later on. To assist with holding the parts for painting I like to use some Tamiya tape wrapped to form double sided tape. This is stuck to some spare cardboard and the door then stuck to the tape. Very solid and alleviates the mess. Being a USN aircraft the gear bays are white and so is the inside of the doors. 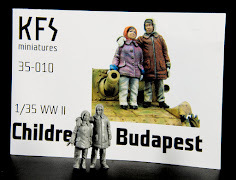 First step is to paint them white (again Tamiya White Primer has been used). Another feature of most USN aircraft is the use of safety red on the edges of all gear doors (and often other protruding airframe parts). A light coat of red was applied over the white around the edges. This red was subsequently masked off and the white was touched up to cover the red overspray. The finished gear doors make a colourful addition to the otherwise very grey model. 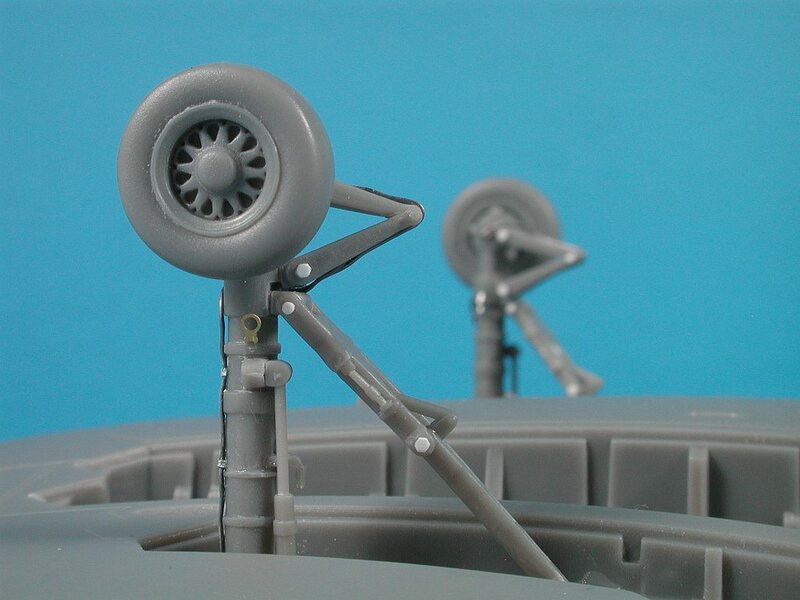 Step 5.4 focuses on the assembly of the lower antennae and gear bay details (such as they are). 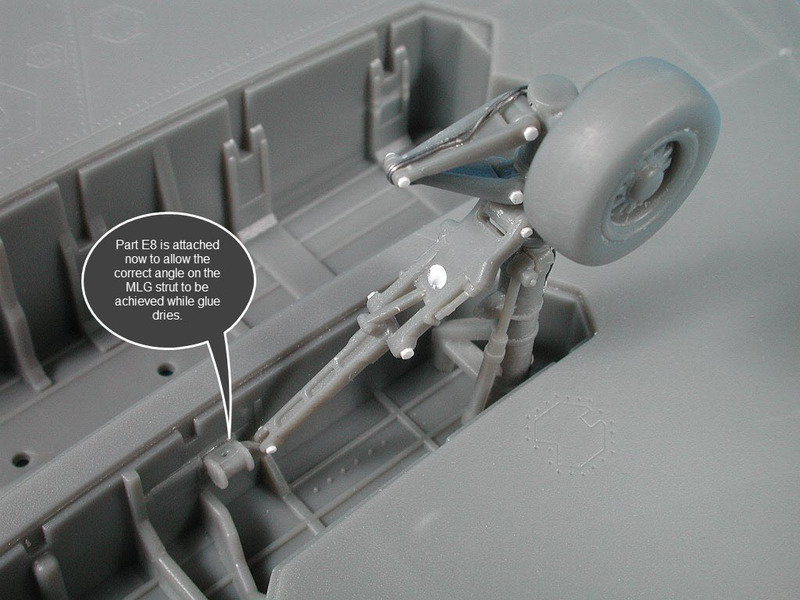 Parts E8 (left & right) are installed in the main gear bays and provide the attachment points for the support struts on the landing gear themselves. With all the relevant antennae attached to the lower surface (at the appropriate angle to the fuselage) I also spent a little time adding some ribbing detail to the tail hook bay. This just looked so bare that I felt it needed something so I used my imagination as no picture showing the interior were available. Step 5.4 continues with the remainder of the lower surfaces assembly. If like me you plan to close the bomb bay doors now is the time to do that. The flaps can be attached and I preferred to leave the undercarriage legs/ doors plus the tail hook off until all major painting was complete. 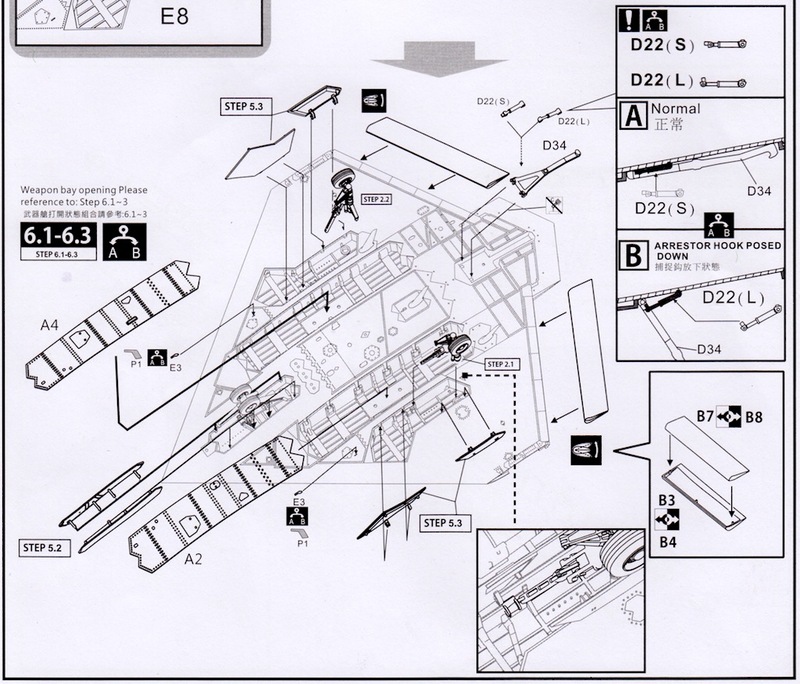 As mentioned at the start of this article I like the attention to detail that Freedom has included in the instructions by providing the small callout diagrams on the side showing mostly how things should be aligned and close-ups of how things fit together. This helps take the guess work out. One tip I would offer is that you should also leave the two pitots (E3 or P1 in photo etch) off until the very end as they are very prone to breakage (don't ask me how I know this). I captured this photo from a YouTube video of the tail-hook testing. It was about the only way I could get at least some form of reference. Notice the wiring attached to the surface of the hook body. Also note that the tail-hook bay is not painted white (well it does not look white to me in this or any of the other photos I could find). Another photo captured from a video. 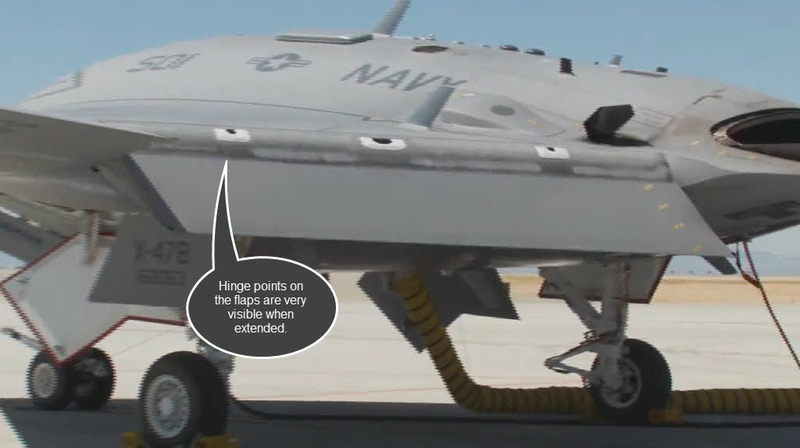 This time the X-47 control surfaces are being put thru a self-test and as the flaps are fully deployed I hit pause. 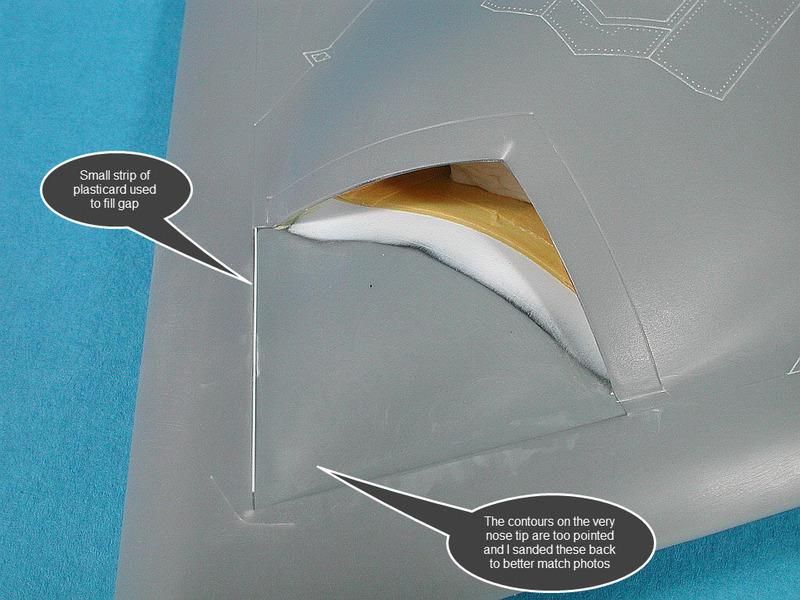 Notice the 3 white sections on the leading edge of the flap which are very visible when its extended. My guess is that these correspond to the hinge points on the flap. 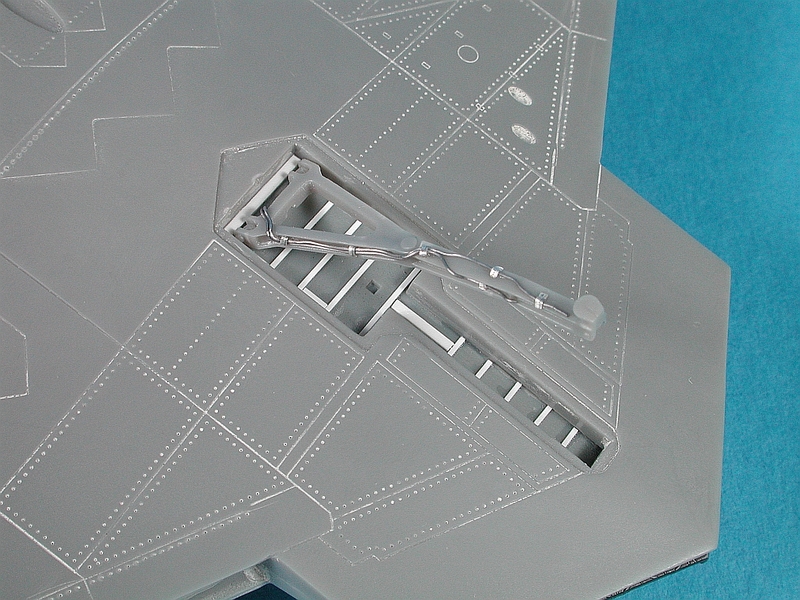 As I planned to drop the flaps on my X-47 I wanted to try and re-produce this interesting detail. 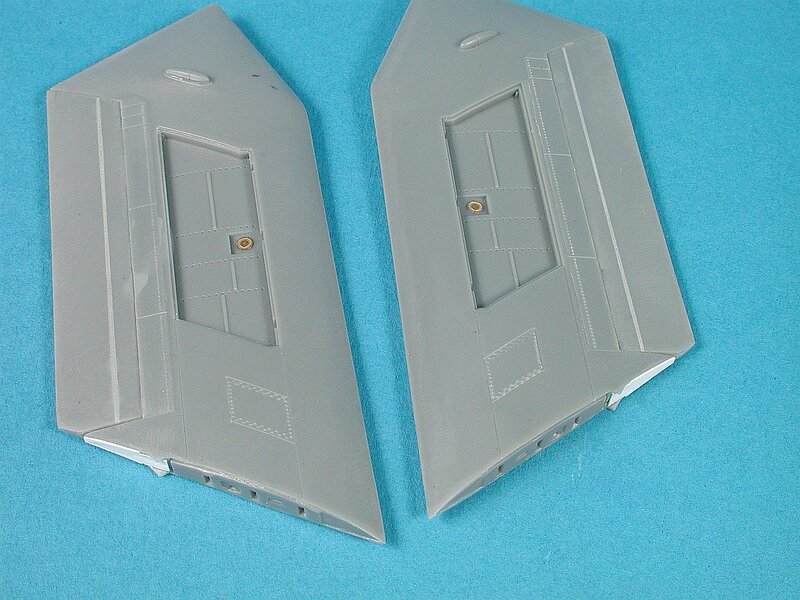 The fit of the bomb bay doors was pretty good, especially considering the complex curvature of these parts. Freedom did a good job of getting this right. Still, I found that the gap at the rear join on both bomb bay doors was too wide for my taste and so I filled the join with super glue and then re-scribed the panel lines. 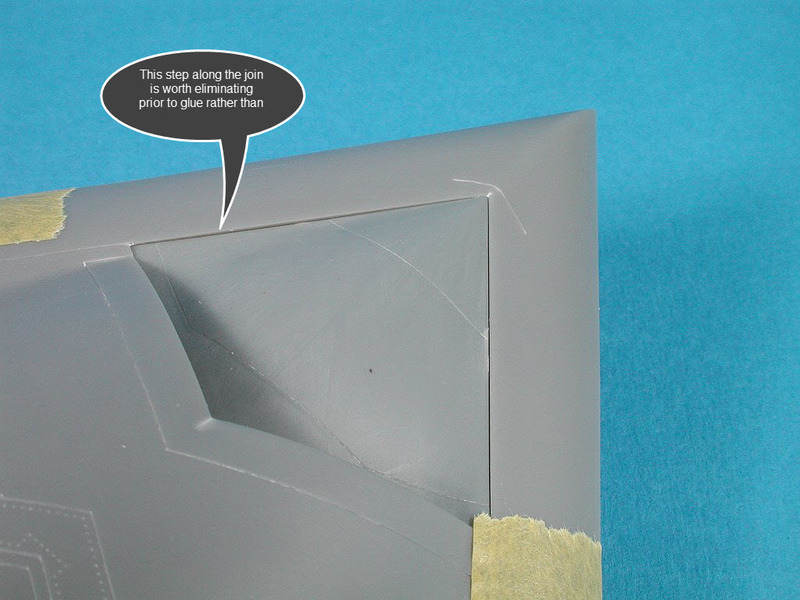 Here you can see I am using my favourite Pactra vinyl tape as a guide for the scriber. I did not want to "go to town" on the tail-hook but decided that some effort was warranted as I planned to show the hook in the down position. Here you can see some 0.3mm lead wire attached to the hook and the hook being test fitted to the airframe. This view also affords us a good shot of the basic ribbing I created inside the bay itself to add a little interest. 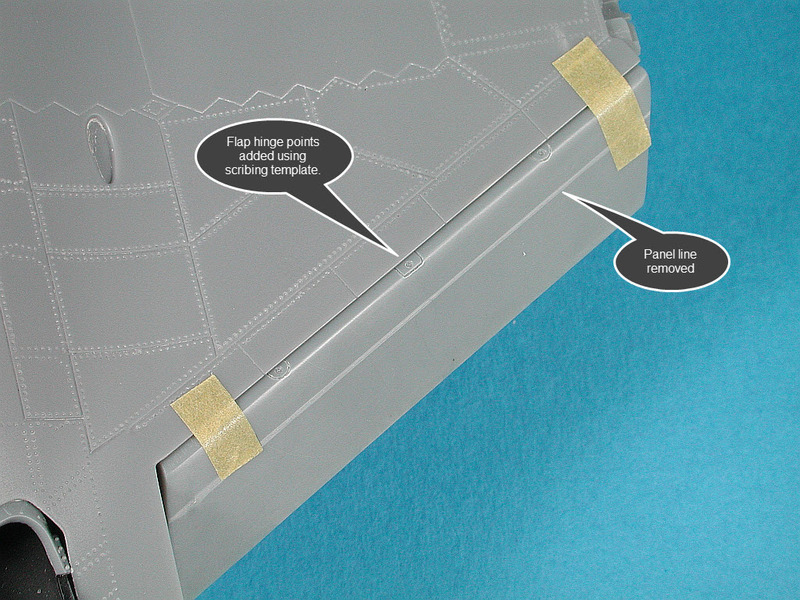 Like the ailerons, I filled the panel lines on the flap and then used some Verlinden scribing templates to help create the three hinge covers as seen in the photo above. 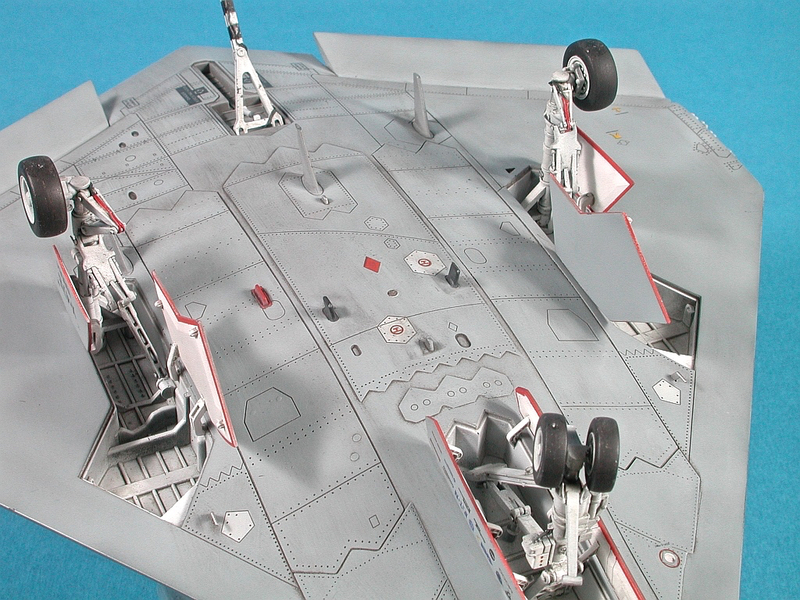 These would later be painted white and weathered to match photos of the X-47. The tail-hook has yet to have the cabling painted but the base white has been done. The black bands on the rear section are actually decals supplied in the kit. I used these instead of masking and spraying black because I thought it would give me a better result. Trying to mask the small undercut edges of the part would have been quite challenging.